Over the objections of state attorneys that doing so would effectively repeal a 2016 voter initiative, the Senate State Affairs Committee on Thursday approved an amendment that would change the state’s automatic voter registration tied to the PFD to an opt-in system. The amendment was offered by Sen. John Coghill, R-North Pole, that would require people filing for their PFDs to opt into registering to vote. The automatic voter registration initiative was passed on a wide margin in the 2016 elections with nearly 65 percent of voters supporting the measure. It allows people signing up for their dividends to automatically register to vote or update their registration (something that has increased importance with Anchorage’s vote-by-mail elections). The initiative allows people to opt out of registration. Initiatives are constitutionally protected against repeal by the Legislature for two years after passage, but can be amended in minor ways. Coghill said it was a matter of opinion, adding that he believed the voter initiative was just about making it easier to register not about automatic voter registration. 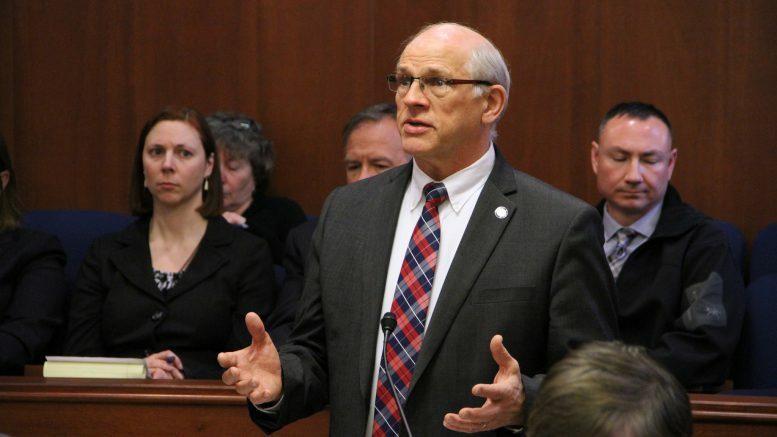 Committee chair Sen. Kevin Meyer, R-Anchorage, said he would support the change, but agreed that it would amount to a repeal of the initiative and ultimately voted against the amendment. He was the lone vote against adopting the amendment. Sens. Coghill, Cathy Giessel and David Wilson, all Republicans, voted in favor of the amendment, as did Juneau Democratic Sen. Dennis Egan. Senate Bill 186 and a companion bill in the House were introduced as minimal updates to the initiative. It would have included an opt-out provision as part of the PFD application, eliminating the need to send out paper opt-out notices separately. The governor’s letter accompanying the bill said it would save the state an estimated $200,000 a year to make the change. According to the Department of Elections, the automatic voter registration system updated the information of about 76,000 Alaskans during the one month where the system and the PFD application period overlapped in 2017. Those 76,000 applicants received notices in the mail that they were either being registered or had their registration updated. Some 27,300 records had to be manually processed because of existing hitches in state law. Senate Bill 186 sought to smooth over those initial problems with the law. Coghill’s amendment would undermine the automatic-ness of the automatic voter registration system, potentially leaving more people without voter registration or up-to-date registration. However it’s unclear just how much of an impact this would have as the Division of Elections above report doesn’t indicate how many people who received voter opt-out notifications chose to do so. 8 Comments on "Senate committee takes the ‘automatic’ out of Alaska’s voter-created automatic voter registration system"
Surely no one is surprised that Republicans would oppose ensuring the maximum number of citizens vote in any election. Coghill is representative of the voter suppression that is endemic to Republican politics – The fewer people who vote, the more power the establishment has to protect the Republican incumbency and the status quo. Disgusting! Legislators have to wait at least two years before undoing a voter initiative that has passed. Why don’t GOP legislators want people to vote? I am tired of all the voter regrestration bs. If you have a drivers license or state that should be your voter regrestration. The division of elections in Anchorage said that 18,000 ballots have been returned as undeliverable as addressed, and that this is due to the state’s voter roles not being updated. This could mean several things up to and including PFD and voting fraud. I’m beginning to wonder now if the entire vote results should be held in abeyance pending a thorough investigation of the state’s voter rolls. Odd, you bring this up after a voter-friendly amendment goes into affect. For some reason the moderator erased my comment, but here it goes again. The MOA division of elections reported two significant items, one, ballots were mailed to local registered voters using the SOA mailing lists which are based off of the PFD, and two, 18,000 mailed ballots were returned to them as undeliverable as addressed-in the first week mind you. I suggested that the voting results be held in abeyance pending an accurate accounting of the list and to eliminate any inherent fraud that might be associated with using the state’s voter rolls. Oops, I take that back.